Chapter Treasurer: Downie, William B, Jr. 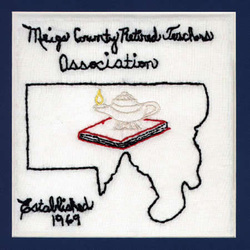 The Meigs County chapter of ORTA, down along the Ohio River, was organized on September 19, 1969 by Katherine McCall of Portsmouth. Southeast District Director of ORTA, with fourteen charter members, took part in the organization. The officers that first year were Lucille Smith, president; Clara Lochary, vice-president; Gladys Hayman, secretary and Anna Hildore, treasurer. Important early projects consisted of helping to establish the Meigs County Council on Aging and contributing time and money toward the Carleton School for mentally challenged children. The group continues today with various noteworthy projects: retirement planning seminars for active teachers; lending many volunteer hours to the Retired Senior Volunteer Program through the senior center; tutoring in reading programs in the schools and participating in a special Yesteryear program of teaching old-time crafts such as quilting and bread making to fifth grade students in the county. Our group may have the oldest still-active volunteer in the state. Her name is Kathleen Scott who is 101 years of age. Kathleen quilts for others and plays the piano at her church each Sunday as she has done since she was 16 years of age.